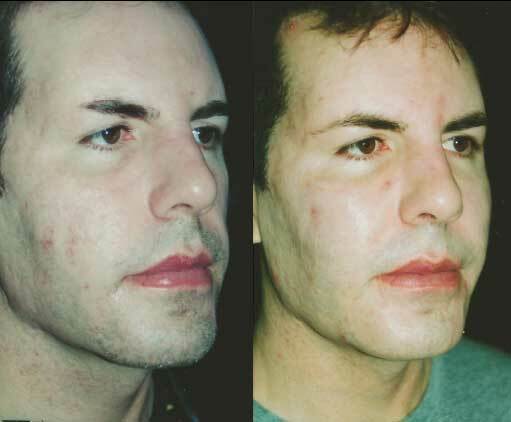 Cheek implants in Los Angeles by Aaron Stone MD can change your facial profile by making the cheek bones higher. Cheek implants (malar implants) are placed to give the appearance of higher or more prominent cheek bones and thereby change the facial profile. The implants are available in a variety of materials (silicone, goretex and medpor), shapes and sizes. The specific cheek implant used can then be chosen by the patient and doctor to achieve a specific result. The augmentation can be more to the front or side depending on patient desires. In some cases 2 different sized implants can be placed to achieve a more left to right symmetric end result. The cheek implants can be placed via an incision in the mouth, eyelid or temple. They are permanently fixed in position by a screw into the underlying bone or temporarily fixed with sutures prior to tissue ingrowth. 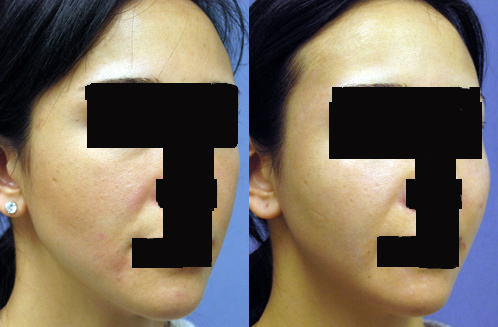 In this case porex medpor cheek implants were placed via incisions in the mouth. Because a small size was too small and a medium size was slightly too large the cheek implants were shaved during surgery to give an intermediate size. These are not the submalar type of cheek implants that extend further down into the cheeks. This patient had different sized porex medpor implants placed in each cheek via incisions inside the mouth to correct congenitally asymmetric cheek bones. Cheek implant surgery can enhance your appearance and your self confidence. Realistic expectations are important to be happy with any surgery. As each patient is an individual, different results can be expected in each patient. Dermal filler and fat injections are increasingly being used as alternative to cheek implants because of their lower cost and quicker recovery. Unfortunately they are not a good or equivalent alternative. Surgery on the bone itself is mostly confined to cheek reduction procedures that are mostly popular in South Korea. As with any type of surgery there is the risk of infection, pain or bleeding that could necessitate removal of the implant(s). The infection rates are higher than for surgery on other body areas because of the bacteria present in the mouth if an intra-oral incision is used. If an implant is removed because of infection it should not be replaced for 3 to 6 months in order to allow sufficient time for the tissue to recover and lower the risk of recurrent infection. The risk of infection is minimized by antibiotics taken for the first few days after surgery and antiseptic oral rinses employed for the first few weeks after surgery. An implant can shift in position or extrude over time. Temporary loss of cheek sensation can occur. Rarely this may be permanent. The most common complication is patient dissatisfaction with implant size and/or position. In my experience patients who pick an implant size that they think would suffice almost always choose too large an implant and therefore have a high rate of dissatisfaction and/or complications. The best way to ensure you will be happy is to pick an implant size you think will work before surgery and then have a size smaller implant placed at surgery. 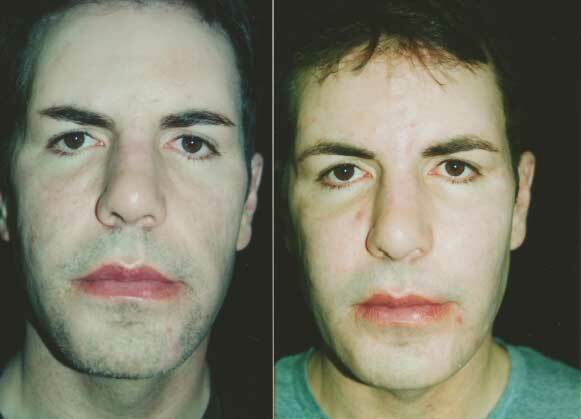 The benefits are improvement in facial symmetry as in the second case demonstrated and a fuller more youthful face. Swelling for an indeterminate period. Much of the swelling will normally disappear in a few days but the remainder may require several weeks, or even months to disappear completely. 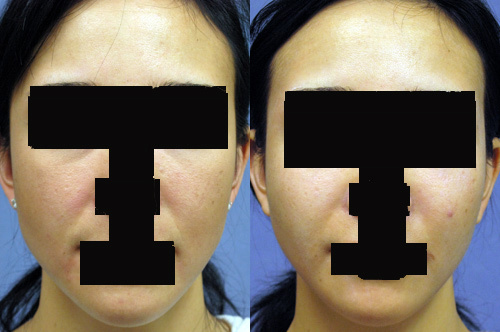 Resolution of the swelling may be uneven resulting in temporary asymmetry. There may be discoloration (black and blue marks) on and about the face, for several days. In some cases the discoloration persists for considerably longer periods. Ice compresses are applied for the first 24 hours to minimize swelling. You can place 3 wet washcloths in the freezer & serially apply them. Alternatively, a bag of frozen peas can be used as a compress. Your head is kept elevated, no lying flat or head down position for 1 week. It is crucial that you eat soft foods and food cut into small pieces for the first 10 days if there are sutures inside your mouth. Eating large sandwiches or corn chips can disrupt the suture lines before they are healed exposing the implants, which routinely get infected when bathed by saliva. No vigorous or strenuous physical activity is allowed for 2 weeks, even jogging at 1 week can cause a problem. Normal activities & work may be resumed within 3 weeks after the operation. You can finance 100% of your cosmetic surgery and select the plan that works best for your budget. There are no upfront costs, no annual fees, and no pre-payment penalties. So, you can schedule your procedure today and conveniently pay with low, monthly payments. Many of Dr. Stone’s patients use the financing option and their is no stigma attached to doing so. Everyone is treated equally regardless of whether their procedure is paid by financing, up front cash or credit card. We encourage all prospective patients to feel free to discuss financing options during their office consultation. Please remember not to choose your cosmetic surgeon based solely on prices for plastic surgery rather than credentials. It is important to thoroughly research your doctor to ensure that he or she has the requisite training, experience, and facility. In addition you should feel comfortable with the Plastic Surgeon you choose. This is important because should any problems arise after surgery you need to feel you can easily call and speak with your surgeon to treat any such problems as quickly as possible. Having a good surgeon that intimidates you or that you feel uncomfortable speaking with does not help the situation. Making sure you get the results you desire the first time around could mean lower cosmetic surgery costs in the long run. Choosing an inexperienced surgeon could jeopardize your safety and result in health problems or the need for follow-up surgeries.